Artworks are on permanent display unless noted otherwise. To see them, you need to have installed the free Layar app on a smartphone (Android, or iPhone 3GS & higher), go to the artworks' locations, and then search for their names. See respective webpages for each exhibit for detailed instructions on locations and search terms. 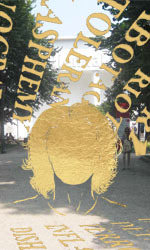 I am the main mastermind of the Manifest.AR uninvited AR intervention at the 2011 Venice Biennial. 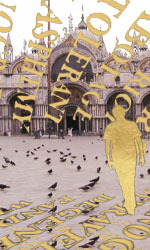 We placed AR artworks in the closed curatorial space of the Giardini, and also as public artworks in Piazza San Marco. 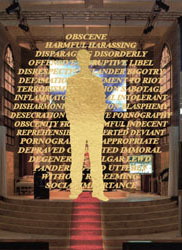 I am showing a new work on censored artists, "Shades of Absence," as my artistic contribution to the intervention. In conjunction with the guerrilla intervention at the 54th Venice Biennial, the Samek Art Gallery is NOT showing our works as the gallery is NOT open during the summer. The works however are piled up in front of the gallery door waiting for it to open in the fall. For details see the press release. For these shows I created the following two artworks. Please click on the images for more information on each one. April 25th is the anniversary of the "Carnation Revolution," that ushered in the end of dictatorship and the beginning of democracy in Portugal. 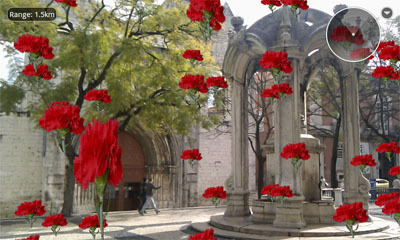 To commemorate this date I created an animated rain of carnation flowers in Largo do Carmo (Carmo Square), where the revolution began. Click on image for more photos and details. An invitational group show at the Devotion Gallery in the Williamsburg neighborhood of Brooklyn, New York City. This AR artwork focuses on the contamination of Newtown Creek, a Superfund site running through the Greenpoint, Williamsburg and Bushwick neighborhoods of Brooklyn. Please click on image for more information and images. This was an invitational group public art show held in the Bushwick neighborhood of Brooklyn, New York City, as part of the Beta Spaces Festival. For this show I created the following two site-specific artworks. Please click on images for more information. This was THE pioneering AR intervention, which took over the iconic Museum of Modern Art (MoMA) in New York City as part of the Conflux Festival. Please click on image for more information.